GO-EASY LIGHTING, a superb new range of cool running, lightweight , fluorescent luminaires in 1,2,or 4 bank fixtures,2ft or 4 ft options. 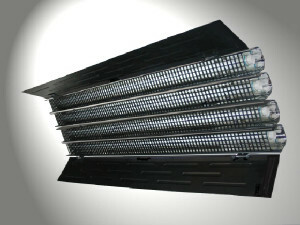 with egg crate louvres and barndoors.The fixtures come with a snap on back plate incorporating a universal joint and spigot for mounting on lighting stands,enabling adjustment to any angle.A multi purpose griphead is available to fit all stands.All tubes are available in Daylight 5600K or Tungsten 3200K colour temperature. GO-EASY ELECTRONIC BALLASTS come in 1,2,or 4 channel versions, either switchable or dimmable, feature 2f or 4ft selector switchs to suit the fixture in use, and 90/240 VAC mains selector switch.The ballasts come with 25ft cable to luminaire, and 2 mtr mains cable IEC.All tubes can be individually switched.The dimmable ballasts have the following dimming range: 2ft tubes-10-50W 4ft tubes 20-100W.All ballasts feature full electronic protection for live disconnect,overload and overtemp.